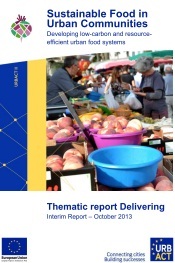 The interim thematic report“Delivering” explores ways to distribute, share and procure local food inside the city. It captures the exchanges between network partners during 2013, notably during the Amersfoort workshop in April. It considers more sustainable and less carbon intensive delivery systems giving efficient opportunities to local production; enabling direct links between supply and demand for sustainable food; facilitating the transition of existing distribution market actors towards greater sustainability and lower carbon intensity; stimulating the emergence of new ones (e.g. food businesses, retail…) and other local initiatives (e.g. markets, purchasing groups, network s, transparency in food chain…). 1. Governance, synergies & local system: how we can link multiple promising food delivering practices, develop synergies, increase resilience and generate the vision of a coherent local food system. 2. Social Inclusion, jobs & economics: how we can leverage on sustainable food transition to reduce food poverty, foster (re)engagement with food, support inclusion of marginalized and underprivileged population groups and enhance cohesion between communities. How we can consolidate promising food practices, transform them into sustainable businesses and upscale sustainable food initiatives to reach a larger share of the population. 3. CO2 & resource efficiency: how we can check and improve promising food practices in order to reduce emissions and impact on resources and energy. Food has traditionally been dealt with at higher national or regional levels. An approach at city level requires pooling together sectors that did not particularly interact before. It requires learning from each other’s food governance approaches (e.g. Bristol’s Food policy council, Amersfoort’s bottom-up facilitation…), drawing on the URBACT methodology & capacity building related to Local Support Groups and Local Action Plans. It also requires an initial inventory or mapping of what is already in place in the partner cities in the area of sustainable food, in order to each take targeted actions to generate synergies, upscale initiatives and strengthen the local food system. How to assess the food system and establish a Food Policy Council? What opportunity for the use of a brand or label for sustainable food and with which criteria and goals? Why and how to develop local food markets? What could be the use of an internet/online platform? How can public authorities do more with less? Faster than ever the value of money, human capital and (food) products are changing and to keep up innovation is of importance. One aspect of innovation is job creation. Growing sustainable food and committing the local community to it, is an innovative way of acting upon all this. But it raises also some questions with regards to the focus ‘Delivering’. What is the job and economic impact in the sustainable food field? Which education and/or formation and/or research about local/sustainable food are available or required? Could we develop concrete tools to strengthen the local economy, such as a local currency? How could we organize or stimulate the organization of innovative socially inclusive initiatives? It seems that this field calls for a need to change our perception of what is profitable economy, including the deep change of standards of quality of life: cut down on costs, buy less but better products, have a good life where you live, produce food for you on. Finally, changing people’s lifestyle is a process. How can we check and improve promising food practices in order to reduce emissions and impacts on resources and energy? Shorten the local food supply chain: define ‘local’? How to develop small-scale combinations of sustainable transportation? Does the development a food hub/logistical platform contribute to CO2 reduction and resources efficiency? How to match food use and seasons in order to shorten the food supply chain? How can food and packaging waste be reduced? The last 2 subtopics have not been worked in any depth yet by the partner cities. Logistics can be seen as a global issue for cities (cars and bike traffic management, public transportation, goods and waste transportation), it is therefore also about urban planning where sustainable food should find a place. The main question lays in the way to change the scale of our food model, leaving small initiatives and experimentation field to reach a model able to compete with the actual global food model. Could we apply the existing global model to sustainable food (centralized hubs)? Or should we consider multiplying small-scale companies (decentralized production and distribution)? Does a third path exist in between? From cases to policies: the aim of the project is to draw general conclusions from specific experiences and to induce policy innovation. Building on logistics: the delivering topic is focusing on food building on food expertise where expertise on logistic is needed instead. Public innovation: regarding the communication of public authority the challenge is to change the top down process of communication into a crowd open-source style. What is not local: the project does not allow research space to define what is local, the partners are instead able to agree on what is not local at all, what is obviously not sustainable or what is a perverse logistic system. Knowing is caring: marketing studies show what the consumer is requiring: a general request of locality and transparency. But locality doesn’t mean that is quality or sustainable. Bringing together producers and consumers has an important consequence: they take care of each other. The general idea is that local should not be analysed like a sustainable solution (wether environmental impact of local products is better or not) but it should be considered as a more global sustainable strategy to improve the local food eco-system, the quality, the sustainability, the healthiness of food. The delivery subtheme seems to be framed by to two major fields: logistics and points of sale. Both fit into the concept of “matching offer and demand in sustainable food”. How to organize and synergize initiatives in order to change scale in sustainable food delivering processes? How could we organize or stimulate innovative (socially inclusive) delivering initiatives? How to bring sustainable food closer to deprived population: geographically, economically, etc.?. What can be done to allow access for sustainable food to everyone? How do local markets stimulate local economy? What means local, wholesale market, short food supply chain? – Logistics (platform)/development of a food hub/logistical system (does this contribute to CO2 reduction and resource efficiency (last mile problem)? – How to develop small-scale combinations of sustainable transportation?